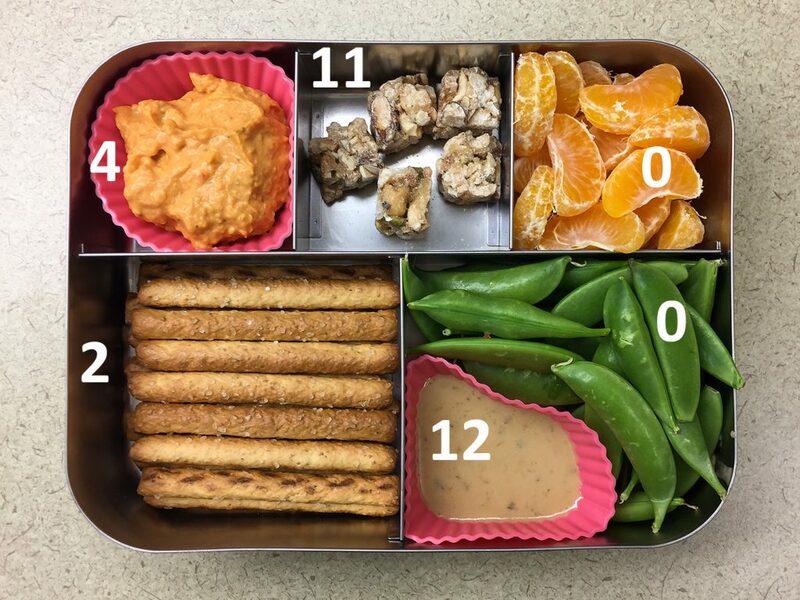 How Much Fat is in My Lunch? We finally made it to fat! 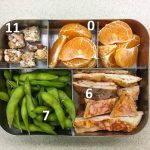 This is the fourth in a series of posts on the nutritional content of my lunches, including calories, protein, and carbohydrate. Today it’s fat’s turn, and boy did I learn a thing or two from logging my lipids. Fat is a valuable nutrient, important in cell structure and hormone production. We need some in our diet, which is great news because fat makes food taste incredible. But fat is more concentrated in calories than the alternatives. Fat has 9 calories per gram while carbohydrate and protein each have 4 calories per gram. 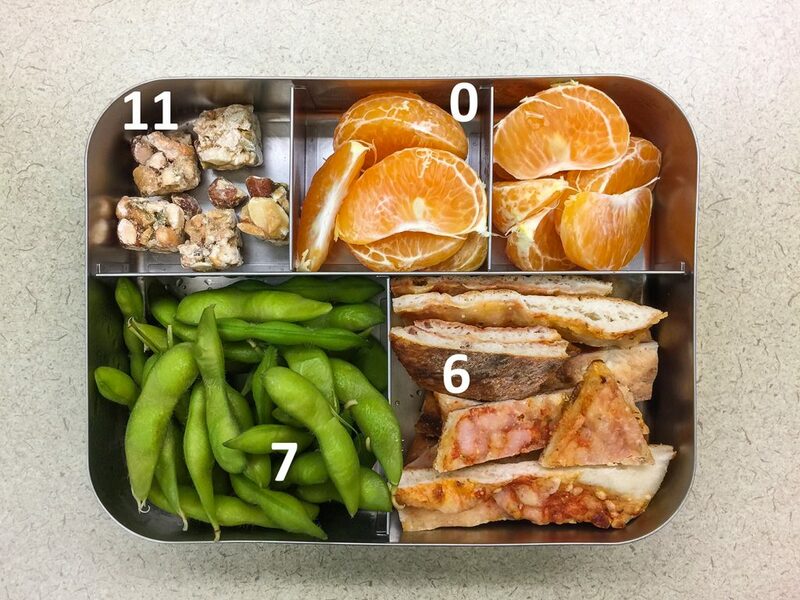 So extra fat on your plate, or in your bento lunch box, means extra calories in your mouth. With fat, portion control is a wise move. As you peruse the pics below, keep in mind a healthy ball park for daily fat intake is around 45 to 75 grams for a 2000 calorie diet. There are different types of fat, of course, like saturated and omega-3 fats but I’ll save that complex topic for another post entirely. Today we’re just focusing on total fat. Well, what did you notice? 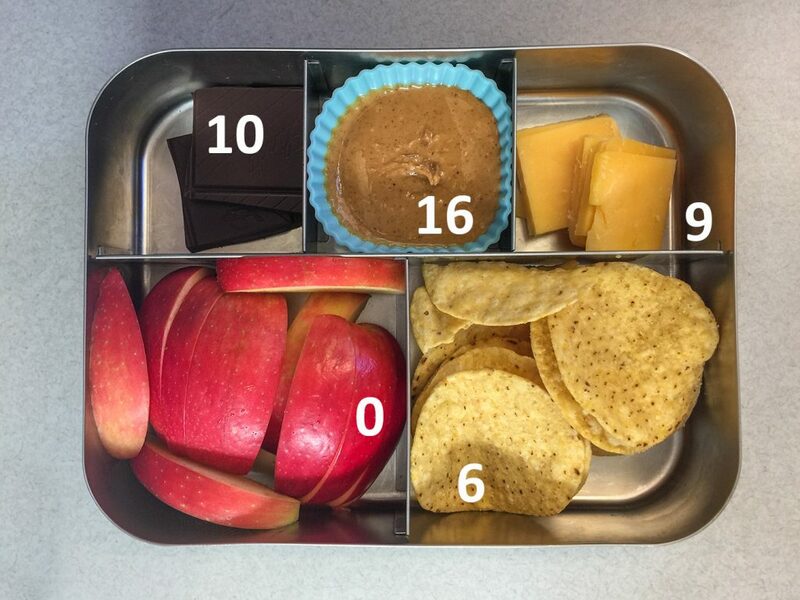 I noticed that my lunches are much higher in fat than I would have guessed. Peanut butter and cashews are relatively high in fat but it’s healthy, plant-based, unsaturated fat. That doesn’t help the calorie situation at all, but it does make a difference in your risk of heart disease. And nuts and seeds are vital components of many of the recommended health-promoting plant-based diets. Fruits and veggies are usually low in fat. Fruit isn’t entirely fat free, but it’s pretty low. 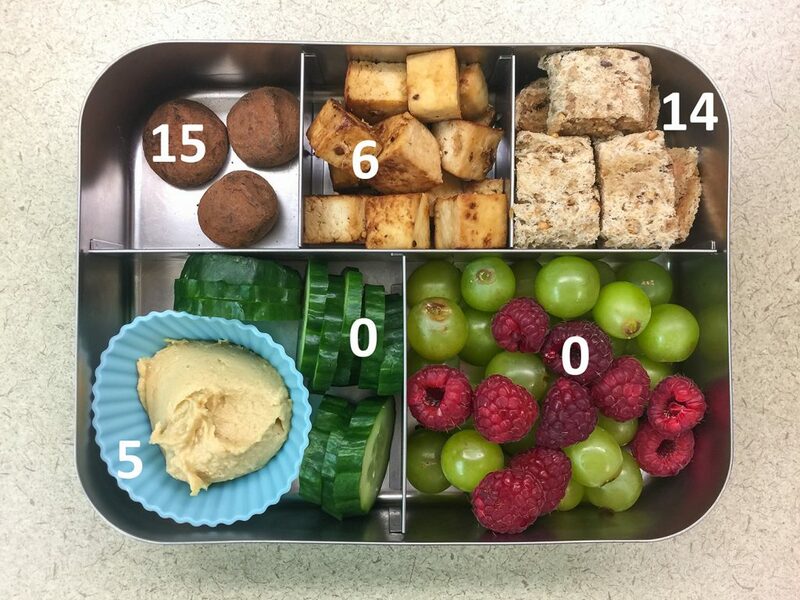 If the total fat for my fruit bento compartment was less than half a gram I rounded down to zero. Crackers really vary in their fat content. Just look at the crispbreads compared to the Mary’s Gone Crackers. What could I do next time to put these fat totals in a more reasonable place? I could keep my beloved crispbread crackers in the rotation, but also choose some lower fat crackers on the other days for balance. I could also opt for part skim mozzarella cheese instead of my preferred sharp cheddar to shave off a few grams too. I might opt to replace the cheese some days entirely and use a lower fat protein choice like roasted chickpeas, tofu, edamame, or tempeh. 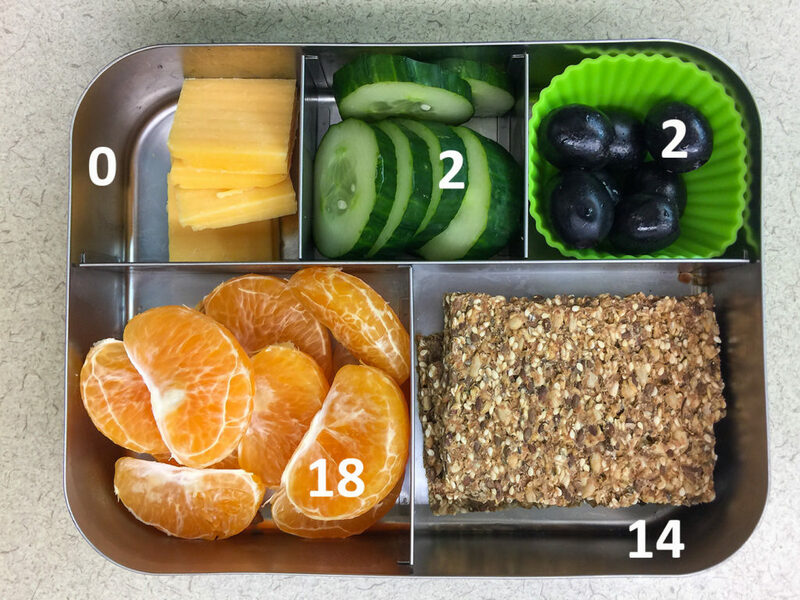 What I learned about my lunch packing skills is that I need more veggies and that my little chocolate indulgences really pack a fat punch and push up my overall totals more than I thought they would. 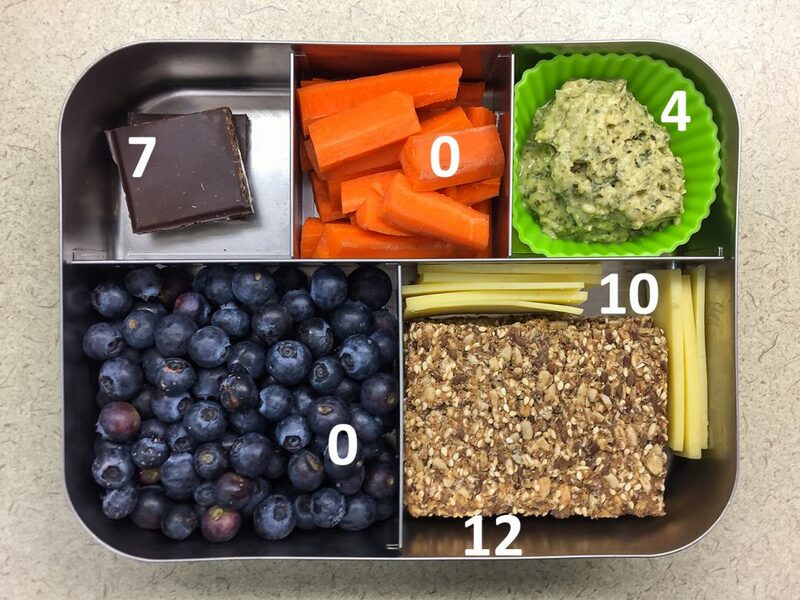 Smaller chocolate portions or less frequent chocolate portions, and more broccoli and cauliflower seems like the right direction to go. Keeping track of these values every once in a while serves as a good reminder for me that meal planning makes a difference, by helping us stay in the right lanes regarding fat, carbohydrate, protein, and calories. 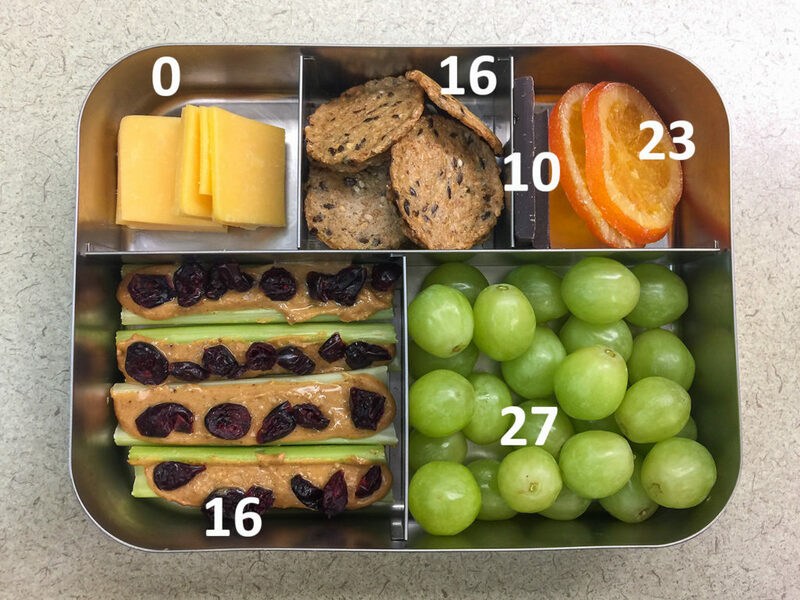 It also reminds me that even healthy foods packed into a dietitian’s cute, categorized lunch container occasionally need some nutritional supervision. How are you doing with fat intake these days? Are you keeping an eye on it or doing a little indulging? Why fat is necessary to our body? I am gaining weight day by day, then why I will consume fat? Please, give me some suggestion. Fat is necessary because our body uses it for insulation, padding (protection for bones and muscles), and for making bile acids and some hormones. 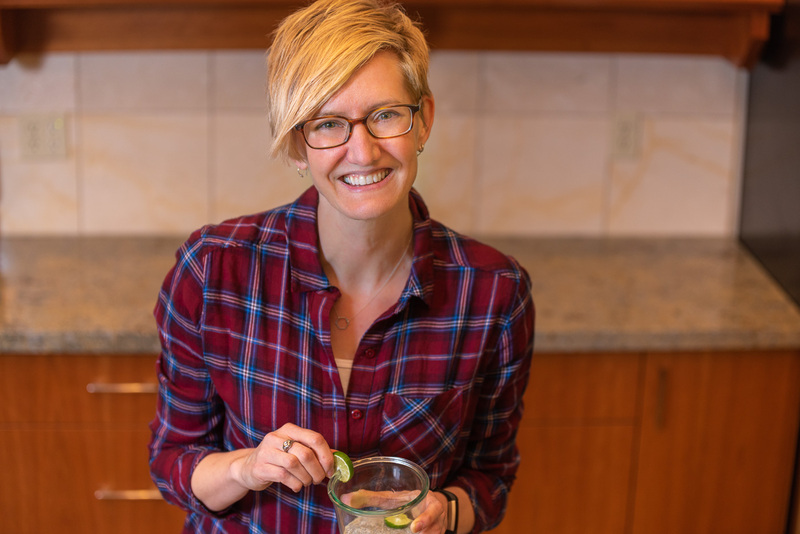 I’m not sure I understand your follow-up question…fat does have 9 calories per gram so it can be a heavy hitter when it comes to you daily calorie intake and weight gain. If you’re trying to lose weight you may want to control your intake of fat somewhat, but a healthy diet includes some fat. We don’t have evidence that a diet without fat is healthful. Thankyou Kristine for a valuable reply!